My concerned/exasperated hiking companions said this to me countless times throughout the spring and summer of 2017. At its heaviest, my pack would top out at around 42 lbs with a full re-supply. At its lightest, I would estimate that my pack’s weight came in somewhere in the high 20’s. On average, I probably carried between 34 and 38 lbs. It was too much for me. 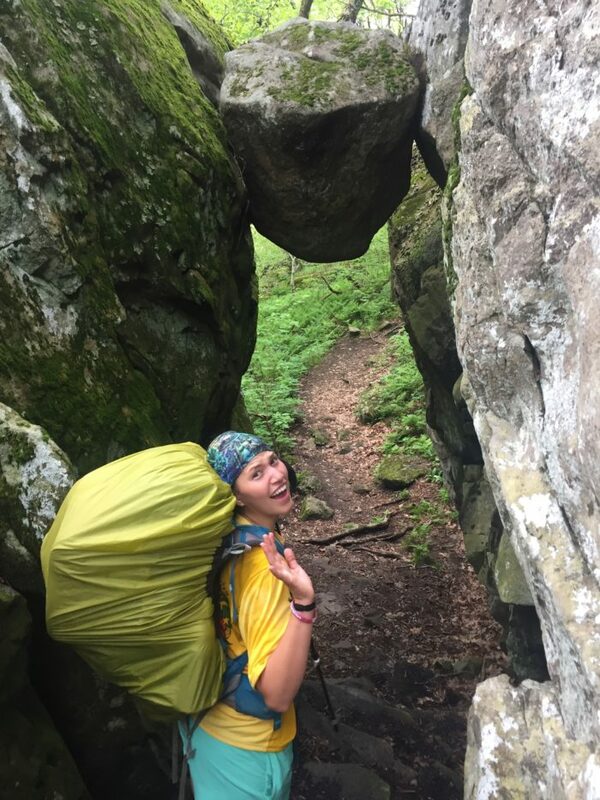 That I had chosen to carry more than I could handle was made clear by the plantar fasciitis and tendinitis in both of my feet, the pain in my knees, the frequent falls I took while descending, and the fact that my body always seemed to be breaking down further instead of getting stronger. Still, I was too cheap and stubborn to replace most of my original gear with lighter options and too sentimental to part with many items that other thru-hikers would have forsaken by Neel Gap. By the time I got to Katahdin, I was still carrying water purification tablets from the start of my hike that I had never used, about 20 stickers that I had bought at trail days, 8 patches that I had meant to sew onto my pack but never did, a wine opener, and a candle that I had picked up in Damascus “just in case I ever needed a nice candlelit dinner,” among other things. Weight issues aside, however, I did learn a thing or two about gear during the five months that I lived in the woods. Here is a sampling of the important things I carried and the low-down on how they performed during my hike. There are reasons why I was the only person I saw on the entire trail who had this pack, though I must admit that overall it performed pretty well for me. As more standard, non-minimalist packs go, it is not terribly heavy. It is actually lighter than the women’s packs of the same capacity from Gregory, Osprey, and Deuter. There were a few times when I re-supplied heavy and had a hard time fitting everything in it, but for the most part it had more than enough room for all of my stuff. 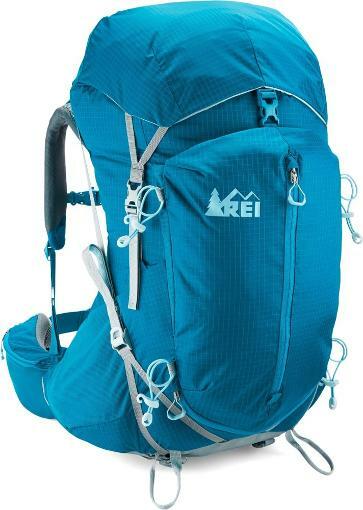 I’m a pretty average sized girl (5’5”, 125 lbs) and I found this pack fit my body well and did a good job distributing weight so that my back and shoulders never felt overly strained. I think this was mostly due to the compression feature that allows you to lift the weight up and towards the center once it is packed. It was fairly durable except that one of the shoulder straps began to fray around the CT/MA border and finally gave way as I was climbing Mount Washington (fortunately my boyfriend was able to make a hasty repair with a pocket knife and a caribiner). My major beef was with the pockets/overall storage capabilities. The hip belt pockets were a little pointless, considering that you couldn’t really fit your phone or most snacks in them. Also, the side pockets that are presumably intended for water bottles are angled, so anything you put in them falls out. I didn’t care much for the front pocket either, since nothing would fit in it if the main compartment was full. Verdict: I probably would not recommend this pack for a thru-hike. I would either trade it for an Osprey with a better layout and lifetime guarantee, or an ultralight pack from a brand like Hyperlite or ZPacks. I absolutely loved this tent. It may not qualify as ultralight, but if you are sharing your shelter with another person, this is the way to go. The double side entrances allow you to get in and out of the tent easily without having to disturb the other person. Nights that I slept solo I could fit every piece of gear I had inside the tent and still had tons of room. On nights when I shared with someone, the two vestibules gave plenty of cover to our packs and shoes outside the tent, and inside the tent there was still lots of headroom and plenty of space for both of our gear and for us to fit comfortably side by side. There was a nice pocket at the head of the tent to store essentials in, as well as a couple of overhead pockets for items like headlamps. My hiking partner started out with a Big Agnes Copper Spur UL 2 tent which, although similar in many respects, would have provided significantly less space for our gear on the very cold nights in the beginning when we shared my tent to keep warm. When I started hiking with my boyfriend, it never even occurred to us to try sharing his Big Agnes Fly Creek UL 2 tent. It was enough for just him, but there was not enough space in the vestibule for both our gear, let alone inside the tent for the both of us. I also found the REI Quarter Dome to be very durable. I used the footprint and do not have any holes or abrasions to speak of. 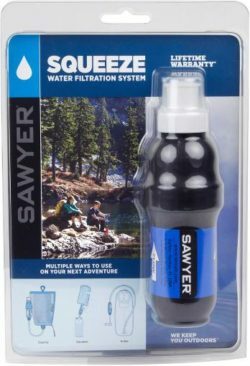 I did occasionally wake up with water inside my tent, but I believe this was mostly from tracking water inside when I was wet or from backsplash coming over the sides when the rain was really coming down as opposed to seepage. 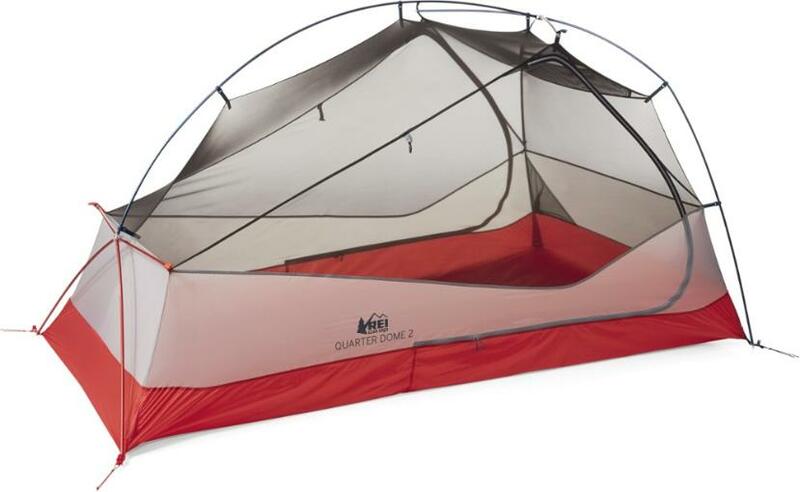 Verdict: Unless you are a solo hiker who is really looking to go ultralight with their shelter, you should get this tent. It’s awesome. The sleeping bag I used on the trail is actually not in production anymore. I bought it on clearance 5 years ago and have not been able to find a trace of it on the internet. However, the Big Agnes Roxy Ann seems highly comparable since it has the same fill, weight, and temperature rating. This bag performed beautifully for me on the trail. There were a few nights in Georgia and North Carolina when the temperature dipped down into the teens and as long as I was wearing a few layers, I managed to sleep pretty comfortably (although getting up in the morning was another matter). I was also impressed with the water resistance of the bag on mornings when I would wake up with pools of water at the bottom of my tent. The bag would certainly dampen if resting in a puddle but it never soaked through and therefore never lost its insulation capabilities. Verdict: Big Agnes makes a wonderful sleeping bag. I would highly recommend this brand, even if you can’t find this exact model. I started the trail with a Therm-a-Rest Z Lite because it was light and cheap. The problem was that I am a side sleeper, and that little foam pad gave me nothing but painful, sleepless nights. After one week, I jumped on the NeoAir bandwagon and never looked back. I’m going to hazard a guess and say that this is the most popular inflatable sleeping pad on the trail, and I can understand why. They may be a bit noisy, but this crinkly little wonder allowed me to sleep comfortably on my side and kept me warm even when my tent stood on frozen ground. In addition to sleep considerations, it also allows you to add the motivational ritual of unscrewing the air valve to deflate your sleeping pad to your morning routine (if you are sleeping next to someone who is particularly unmotivated you can unscrew their air valve as well). The final- and perhaps most important- benefit to this sleeping pad is that it can double as a raft in case you ever want to go floating in a lake or down a river. 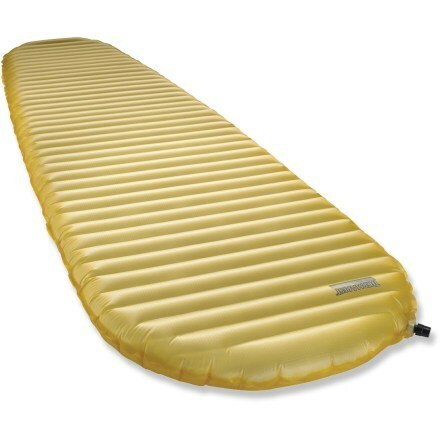 Verdict: I would recommend an inflatable sleeping pad to anyone who plans on hiking a long trail. 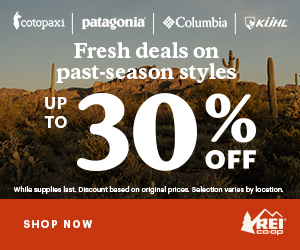 I can personally vouch for the NeoAir, but I hear that Big Agnes, Nemo, and Sea to Summit make great ones as well. The Sawyer Squeeze dominated the water filter scene on the AT this summer. With its low price and operational simplicity, its popularity is easy to understand. I heard some mixed reviews from other thru-hikers, but personally I was very satisfied with my Sawyer. Even with minimal backflushing it never got severely clogged. I had the same filter for the duration of my hike and although it was certainly slower by the time I finished, I was still able to filter water through it just fine. Verdict: Go for it. It is reliable, easy to use, and cheap enough that it can be replaced if necessary. This little cookpot was lightweight, durable, and large enough to cook all my Knorr sides and boxes of Annie’s mac & cheese. When I learned that you could make your own backpacking stove out of cans, I decided that I absolutely had to fabricate one of my very own and use it for my entire hike. I will say that I am to this day extremely proud of the alcohol stove that I managed to produce- it came out looking really nice. However, there are far more efficient stoves out there. 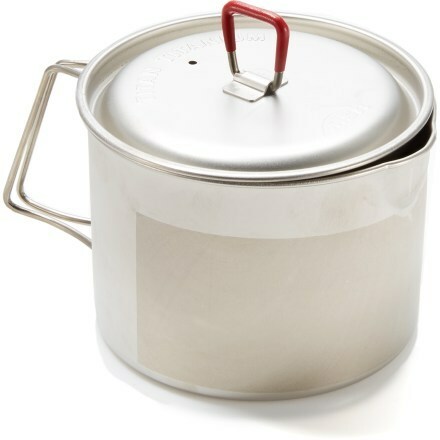 The very popular MSR PocketRocket, for instance, boiled water in less than a third of the time that it took my stove. 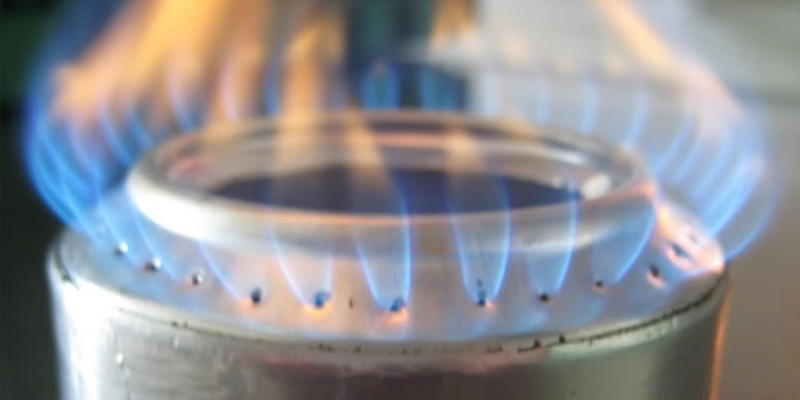 In colder weather it was sometimes hard to even get the fuel lit in the first place and wind often increased cooking time significantly. Stubbornness alone explains why this was still in my pack when I got to Baxter. Verdict: I would recommend a backpacking stove made by professionals. I’m trying to figure out how you didn’t get a trail name like Camel or Bubble Back with all that on your back. Kudos to you for making your gear work. I’m seriously impressed. Jesus that was a lot of weight. I have no clue how you completed the trail carrying all that crap. I’m a 220lb guy and I don’t think I could have carried all that weight for that long. Did you keep that candle? Hey there neighbor. Are you still slinging drinks in Hampton. Going to do Trail Magic this year.